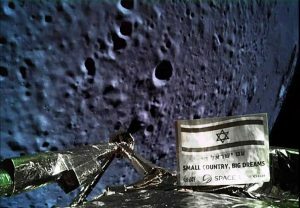 From the Israeli people to Diaspora Jewry to the broader scientific community, there was no shortage of excitement about Israel’s first lunar mission, despite the Beresheet spacecraft’s crash on Thursday. But what does Torah Judaism have to say about space exploration? Does halacha leave room for all the buzz about this moon landing? Better yet, does halacha specifically give Jews an impetus to proactively delve into this subject? There are some Torah scholars who argue that we have more important matters to study than outer space. They ask: Why should we spend time on theories rather than concrete facts, especially when astronomical theories can be contradicted from one generation to the next? It’s a big waste of time, the skeptics claim — and Thursday’s crash might intensify their doubts. Why not just focus on studying Torah? Yet in my view, space exploration is Torah. There’s no disconnection between the two disciplines. In fact, Torah and the world around it — including worlds outside our own planet — operate in complete symbiosis. In the Talmudic exchange in Shabbat 75b, Rabbi Shmuel bar Nachmani asks in the name of Rabbi Yochanan: How do we know that there is a mitzvah to calculate tekufot (seasons) and mazalot (constellations)? The Torah source for this mitzvah comes from Devarim 4:6, which states, “For it your wisdom and understanding in the eyes of all the nations.” In that verse, “wisdom” refers to the calculation of tekufot and mazalot, and the Rambam explains that this calculation refers to astronomy. On a more relatable level for the average Jew, the main takeaway here is that it’s a mitzvah to explore G-d’s universe and creations. And if that’s a mitzvah, it’s incumbent upon us to make a concerted effort to study matters pertaining to outer space, even if we aren’t naturally inclined to do so. There are many who believe that there are contradictions between Torah and science when it comes to trying to understand the age of the universe or addressing the halachic implications of the theory of evolution. Indeed, those topics are important, and a profound study both of Torah and science can remove the apparent contradictions. Studying them shouldn’t come at the expense of studying outer space. Space exploration can have real consequences for our everyday lives, such as the search for alternative sources of water. Recall also that Teflon has been developed for the Apollo program. Many astronomers ask: Where did all the water come from on Earth, when we can’t find it anywhere else, at least in such amounts, in this solar system? I don’t claim to possess the definitive scientific answer. But what I do know — as does anyone familiar with the creation story in Genesis — is that on the second day, G-d separated the “waters above” from the “waters below” through the rakia (firmament). Gaining a deeper understanding of the concept of the rakia is one way in which we can understand the symbiosis between Torah and science. The symbiosis of Torah and science is also precisely the DNA of the Jerusalem College of Technology (JCT), where I formerly served as the college’s president and where I continue to be a teacher and a researcher today. There are those who see Torah and science as separate domains of knowledge, with some connections. But at JCT, we embrace the fact that G-d created one world, and we work to show the total symbiosis between the various aspects of the world. It’s why we empower our students with the ability to balance Torah studies and academic studies within the same schedule. It’s also why we lead initiatives like Israel’s Annual Conference for Torah and Science, which JCT organizes in collaboration with Bar-Ilan University. That’s why I was highly intrigued by Beresheet and will keep studying this subject regardless of Thursday’s outcome — in particular with a talk by an engineer and a Rav, both of them my former students, who are involved in the moon mission. At its core, the Israeli lunar mission is much more than a major news story. It’s a mitzvah. Prof. Noah Dana-Picard is an Israeli mathematician and Talmudic scholar. He is President Emeritus of the Jerusalem College of Technology (JCT). Very interesting. Is the author related to Captain Picard? lol that is exactly the first thought I had as well. Maybe he picked that last name for that very reason, although if so, I wish he had chosen Kirk instead. I applaud your motives. while you quote a gemara, there is a mishnah, that refers to astronomy as providing only accouterments to hokhmah. Hi hokhmashem is our torah based way of living, when observed properly. Why my piddling comment? I view astronomy and all of science, not as Torah, but as other sources of (necessary) wisdom. Raavad’s only critique in the section on calculating the Jewish calendar of Kiddush HaHodesh of Rambam, contains his admission that he was not privileged to learn astronomy. His question proves that. The answer requires knowledge of astronomy, which would explain why Rambam did not give the gemara’s clearly stated reason. Rambam was explaining scientifically why the gemara was not concerned about the (incorrectly assumed negative) impact of its reason for postponing RH. As Dr.Elman ztl often said, most amoraim were modern orthodox; they valued things outside torah – maddah. Unless there is a valid defense angle to this program, I don’t see enough bang for the shekel. The ego boost of a successful mission is not nearly enough. I just do not agree with this at all. Or maybe, I might agree with it only for those few individuals who show an early and strong inclination toward science, as Albert Einstein did even when he was just a child. However, for the vast majority of us more ordinary people, I think that so many other things take priority. First and foremost in our lives, are the issues of health and income. It is astronomically (pun intended) more difficult to do anything we want to do in our lives, if we are in poor health and/or are not financially independent. Once we have a pretty good handle on both health and finances, we Jews can then try to find some kind of ideal balance between devotion to our families, our local Jewish community, and Torah study. The problem with equating science or any other secular field of study with the Torah, is that one can then so easily fall into the trap of pursuing only secular wisdom. One might be inclined to say that there is nothing inherently wrong with that, but our time and our energy in this world is limited. That may not be something that young and healthy people have any awareness of, but such realities of life sure do creep up on all of us, as the years go by and our energy all too quickly dissipates. If we Jews do not devote ourselves to Torah study, who will? And if not now, when? For the truth is that we Jews are so few in number and are, after all, the ones whom G-d has chosen to spread Torah teachings to our fellow Jews, and even to the world at large to some extent, and so that needs to be our focus. Does this mean that I advocate a Torah Only approach to life? Not at all, as that would not be realistic, and yet other than whatever studies promotes better health and more financial stability, Torah study must be the not-necessarily-exclusive priority. Or to put it another way, Torah study should be like our regular 9 to 5 jobs, while secular studies can be compared to taking a very temporary vacation from our usual routines. And on a larger, more global scale, I think that Israel’s incursion into space was not only a big waste of time, but such a waste of valuable resources that could have instead been spent on feeding poor, hungry Jews, or on medical research. And even for those who have a special proclivity toward science, it seems to me that there is still plenty of things to explore right here on Earth, such as our deep forests and even deeper oceans, to keep scientists busy for many centuries to come. As a YU alum, I feel obligated to point out that the Torah U-Madda conference is jointly sponsored by Machon Lev (JCT), Bar Ilan, and YU. Its location rotates between the three- YU’s Jerusalem campus in their case. Next story Who Deserves to be Our Hero?